Three WASL members received the N-Peace awards. Mira Kusumarini won the Untold Stories Indonesia award for working to prevent violent extremism through reintegrating women and children into society. Mary Akrami won the Campaigning for Action award for establishing peace shuras for women seeking conflict resolution. Visaka Dharmadasa won the Untold Stories Sri Lanka award for encouraging important dialogue between women of different ethnicities. N-Peace, a UNDP initiative founded in 2010, recognizes the powerful stories of peace-builders and activists in the region who embody the women, peace, and security agenda. N-Peace presents up to 11 awards to grassroots activists, prominent campaigners, and up-and-coming young peace advocates. All recipients must have worked on furthering the cause of peace, gender equality, equal participation, and empowerment of women, in any of the following areas: participation, conflict resolution, protection, and relief or recovery. 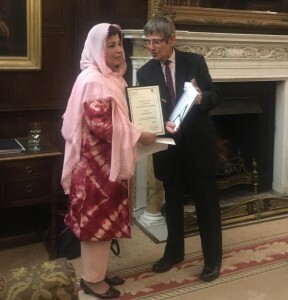 Mossarat Qadeem received the Marsh Christian Trust Award for peacemaking and peacekeeping in the UK. This award recognizes individuals outside of the UK who have made an impactful contribution to peacemaking and peacekeeping in areas of conflict. The Marsh Christian Trust was founded in 1981 by its current Chairman, Mr. Brian Marsh OBE by supporting people who are making a difference. Nominations for the Award are put forward by Wilton Park staff and are shortlisted by members of the Wilton Park Advisory Council. The shortlist is put forward to the Marsh Christian Trust for final judging. 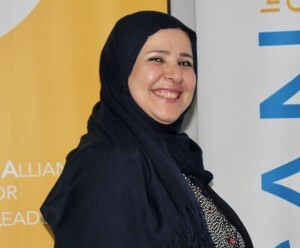 Najlaa Sheekh was a finalist for Peace Direct’s Tomorrow’s Peacebuilder Awards this year. Najlaa attended and spoke along with other finalists at the Alliance for Peacebuilding conference in October. Her organization Kareemat, the first Syrian women-led organization in Turkey, has helped Syrian women refugees in Turkey with literacy, economic empowerment, and psychosocial support. Tomorrow’s Peacebuilders are global awards for local peacebuilding, which give international recognition to grassroots activists in conflict affected countries. We would like to congratulate our colleagues and partners for these awards and are thrilled by the recognition of their valuable and impactful work.